President Donald Trump talks with Prime Minister Justin Trudeau in Charlevoix on June 8, 2018. 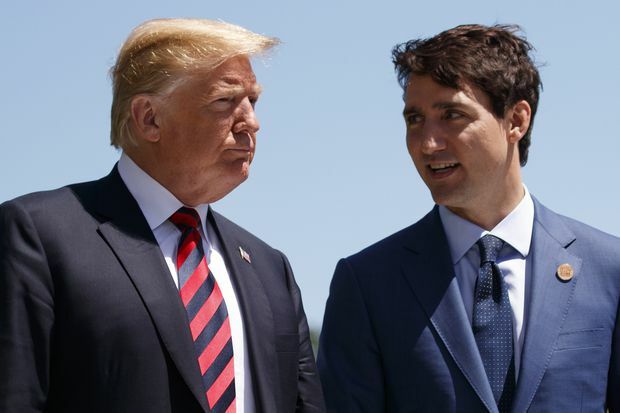 In suggesting that Canada might “come along” in the current NAFTA negotiations, President Donald Trump is doubtless unaware that a come-along is a winch with a handle used to tighten straps on a load (President Hints Canada Is Being Kept Out Of NAFTA Talks On Purpose – Aug. 17). A winch (or wince) is also defined as an animal that kicks when threatened or stressed. Woe betide the idiot who stands behind a kicking donkey, whether it be the symbolic mascot of the U.S. Democratic Party or the terrestrial kind. The talking point du jour surrounding the issue of gang violence has been Toronto Mayor John Tory’s “why does anyone need a gun in the city at all?” – an approach that conflates lawful gun ownership and gang violence. It’s a fallacious argument. Why does anyone need a cigarette? Each day, 100 Canadians die of a smoking-related illness. Why does anyone need alcohol? Alcohol is responsible for thousands of Canadian deaths every year. Mr. Tory’s words make for a a nice slogan, and discussing a potential gun ban is good for politics and the media. However, living right next door to the handgun arsenal of the world ensures that gang violence using guns will not skip a single beat in the event that a gun ban occurs. Re A Holiday Won’t Solve It (letters, Aug. 17): It’s a long and winding road that leads to reconciliation. Think Martin Luther King Jr. Day in the United States. If the federal government were to grant paid holidays for every legitimate claim of historical discrimination, there would be more paid statutory holidays than there are days in a year. My modest proposal to solve this problem is to have the government proclaim “Victims’ Week,” a paid statutory holiday lasting seven days during which all people (except white males) can celebrate their victimhood while politicians make pompous speeches and apologize on behalf of everyone. It’s complicated. As an adult, I became aware of residential schools. I didn’t learn about this bleak time in our shared history when I attended school in the 1970s in southeastern Saskatchewan. As a mother, I am horrified by the pain inflicted by the removal of children from their homes and families. My heart bleeds when I think about the horrible deeds perpetrated on many of those children. It is a bleak part of our history. There are other bleak episodes which many of us wish had never happened. However, what’s past cannot be undone. Declaring a statutory holiday to commemorate this particular tragedy in our shared history would not be my choice. Designating a day to recognize and remember would be a positive move toward reflection and reconciliation. Like I said, it’s complicated. Re Canada-Saudi Rift: The Next Steps Forward For Ottawa (Aug. 15): Saudi Arabia thinks Canada behaved improperly and Canada thinks Saudi Arabia behaves badly all the time. Canada now has the perfect excuse to stop selling armoured vehicles to the Saudis, to train more Canadians instead of Saudis as doctors, to build a pipeline to Eastern Canada so the Maritimes and Quebec can buy Canadian oil instead of Saudi oil, and, in general, to cease all non-essential communications with this nation that does not wish to hear what we have to say. As long as Saudi Arabia persists in its present course, Canada will have the perfect excuse to decline, if we wish, when some international body or another asks us to get tough on Iran. We can just say we really cannot support Saudi Arabia right now. Everyone, including Donald Trump, will understand. Re Talk Of ‘The End Of Jobs’ Hides Real Labour-Market Issues (Report on Business, Aug. 15): Andrew Jackson makes a fundamental mistake in basing his predictions for the future on past statistical data. Disruptive technologies will be … well … disruptive. The future will not be an extrapolation of the past, and statistics from the past few years are not a guide to the 2020s and beyond. Artificial intelligence, robots, and automated, connected and electric vehicles are poised to make a major impact on the job market. The years 1880-1920 resulted in some of the first cars, the first planes, the first phones, the first radio transmissions, and the electrification of homes and businesses. Those years were literally the bridge between the Victorian era and the 20th Century. Prof. Jackson’s arguments are rather like saying statistical data from the final years of the horse-and-carriage era are a guide to what will happen when cars arrive on the scene. We are entering a new era of disruption that is equally exciting, equally disruptive and will last for several decades. The changes will mainly improve the lives of Canadians, but there will be significant job displacement and the resulting social unrest. Governments need to do more to prepare for this. Re Woods ‘Trending’ As Ryder Cup Pick (Sports, Aug 14): Tiger Woods is a phenom, but only as a golfer. For a long while, he portrayed himself as a model citizen but then failed the morality test. In his second coming, his spectacular brand of golf is still captivating. He has an extraordinary ability to produce a miracle shot when he wants it and when the crowd wants it. He played many a shot like that in his prime, but remarkably, now he is playing them to an audience that includes a new generation. Golf as a game deserves and needs Mr. Woods to reinvent it among the new fans. It would be sad for Jim Furyk to deny Mr. Woods a spot on the Ryder Cup team for his follies off the course. The cable networks would want him to spike their ratings and the fans demonstrated their love for Tiger’s brand of golf in no uncertain terms. In life, decisions are often made subjectively but the explanations come couched in objectivity. Mr. Furyk is in an unenviable spot. Will he see the Woods for the trees? Re Trump Pulls Security Clearance Of Critical Ex-CIA Director (Aug. 16): Interesting to note that President Donald Trump pulled the clearance of an ex-CIA director due to “the risks posed by his erratic conduct and behaviour.” Seems fitting, since Mr. Trump is certainly an expert in the areas of erratic conduct and behaviour.